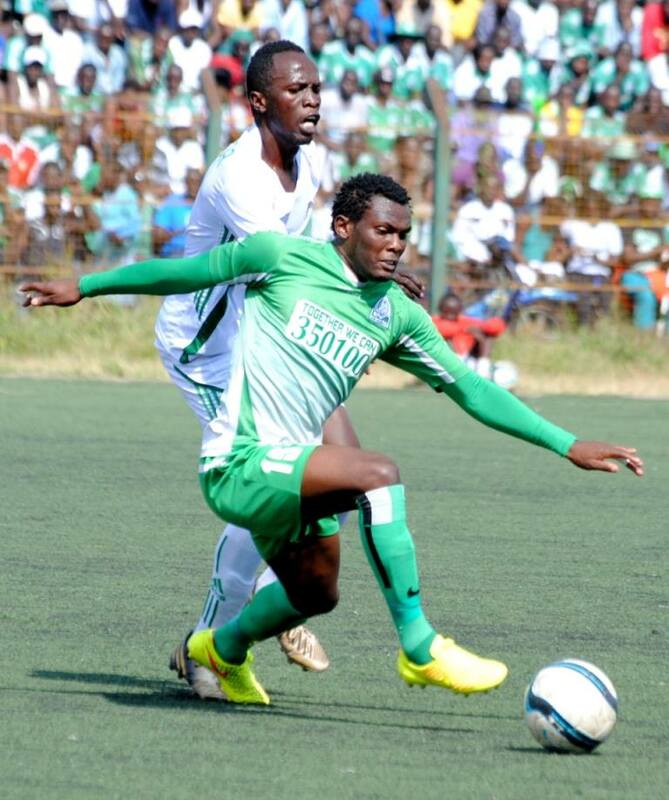 Gor Mahia striker Dan Sserunkuma appears set to join Tanzanian giants Simba. The Uganda Cranes talisman has been attending trials at the Dar es Salaam based club for a week. A report posted on futaa.com suggests that he has passed a medical and set to to put pen to paper on a new contract with Simba. Sserunkuma had earlier been linked with moves to Kaizer Chiefs of South Africa and Al Ahly Shendy of Sudan. At Simba, Sserunkuma will link up with another former Gor Mahia player Raphael Kiongera who joined Simba and in the process bagged a KES 1.8 million signing bonus and a monthly salary of KES 150,000. Sserunkuma’s terms have not been made public. In Tanzania, football has a mass following unlike in Kenya. As such the top sides have been able to cash on the popularity of the sport. The Dar es Salaaam derby typically draws crowds betweeen 50,000 and 60,000 which is roughly three times the number that the mashemeji derby draws. Whereas the Mashemeji derby typically nets about KRS 3.8 million, the Simba-Yanga derby usually nets approximately KES 25 million per game. And these two teams meet about four times a year, twice in the league and again in made-up tournaments like Mtani Jembe cup. This means that in one year, the Simba-Yanga derby can gross KES 100 million whereeas the Mashemeji derby grossed about KES 7 million in 2014. Simba has a sponsorship from the Kilimanjaro been brand which is owned by Tanzania Breweries. The sponsorship is worth Tanzania shillings 495 million which is KES 25 million per year. Vodacom sponsors the Tanzanian league to the tune of Tsh 1.7 billion per year which is KES 88 million per year. That is much higher than the approximately KES 56 million per year that the Kenya premier league gets from Tusker. The Azam media group holds broadcasting rights for the Tanzanian league. They also have individual broadcasting deals with individual teams worth Tsh 4.4 billion. It comes as no shock therefore that Tanzania can lure the best players from Kenya and sometimes even threaten to take coaches who are under contract as they did when they threatened to take Bobby Williamson last year. The Kenyan fans are very, very passionate. There are hordes of them outside the stadium before and after games. They lead the team bus to and from the ground, stopping the traffic, making sure the bus gets out. They’re very vocal, and very colourful. It’s an unbelievable atmosphere. But of course, if you’re not doing well, they’ll soon let you know. Thankfully I haven’t seen that yet. Gor Mahia probably have the best support in Kenya. The stadiums are pretty full when we play – we can get between 8,000 and 10,000 in the city stadium (in Nairobi). The last couple of games we played in Kisumu at Lake Victoria (around 200 miles west of Nairobi) and there were maybe 15,000 or 16,000 there. It was packed. Outside there were maybe 10,000 who couldn’t get in. We’re also on live television most of the time, so we’re getting a huge audience. The passion is unbelievable. Bobby encouraged me, told me I’d enjoy it. He said: “Come for a few months. If you like it, you like it. If you don’t, it’s not the end of the world.” He spoke to one or two people, and recommended me to the club. Other names were mentioned – foreign guys – but they had faith in Bobby’s judgment. The club looked after me from the moment I arrived. The chairman, the committee, all the staff…they’ve been really supportive. They couldn’t have done more. I’ve been living in a hotel – I was due to move into Bobby’s apartment, but he hasn’t been able to move on. But the hotel suited me fine. Bobby had the club first or second when I arrived. So it was a strong unit. The problem was, a couple of months before I arrived, one of the sponsors pulled out and a lot of players left. They were down to the bare bones. Bobby didn’t tell me that before I came, mind you! The players are not millionaires, believe me. You have to make allowances for their situation – their living conditions, where they’re travelling from, how they’re travelling. So if they’re a little late for training, you make allowances. They are very focused – they want to get on, they want to progress. From a technical point of view, they’re very good players. And from a physical point of view, they have great attributes. Quick, strong, fit. When I arrived, we played four games in ten days. And they were very hard games; the type I haven’t seen for a long time. And yet not one of them complained. 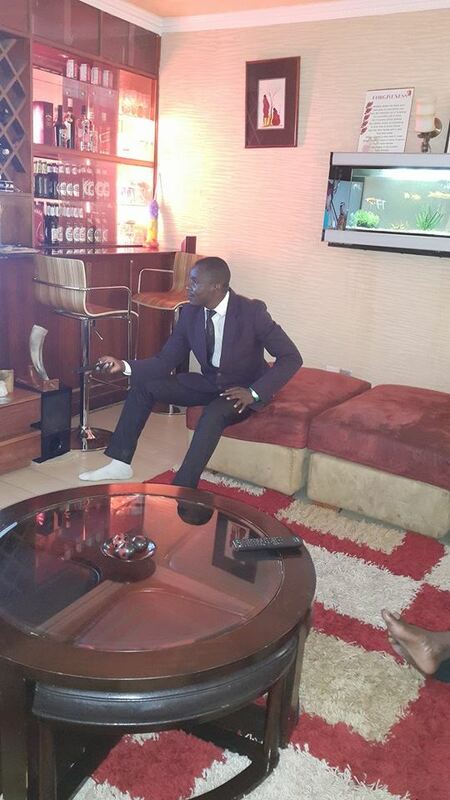 I am in the process of negotiating a new contract with Gor Mahia. If we can agree something, I’d be happy to go back. It was fantastic to win the league, and the African Champions League would be great. Part of my negotiations is, “Do we have the finances and ambition to compete, to get us to the group stages?” Because that would be a great experience. I was a young pro at Celtic but got released in 1987. There was a lot of competition. I could have gone to other clubs, but I was disillusioned. I was 20 – there were no advisers then, no agents, so I just got on with things. Thankfully I had the grades for uni so I went down to Cardiff to study physical education at UWIC (now Cardiff Metropolitan University). Then I went to Loughborough to do a masters in sports science. I started my coaching qualifications at uni, and by age 24 I was doing coach education for the Welsh FA. I worked with their under 14s and under 15s, I worked for the Sports Council, and I was a sports science lecturer at university. But my ambition was always to get back into full-time football. In the 1990s, there weren’t as many possibilities. If you weren’t an established ex-pro, it was very difficult. That has changed a lot now, but then, it was much harder. To get back in, I took a job as fitness coach at West Brom (in 1998). I had no intention of being a fitness coach (long term), but it was a way in. I found myself in a situation where I had a reputation as a good fitness coach. I was pigeon-holed, and I didn’t want that. I did my A Licence at 29, and my Pro Licence by the time I was 34. So the capability (to coach more broadly) was there, but not the opportunity. I tried to keep the frustration in abeyance, tried to keep it private, and wait for the moment. But it was frustrating. I became fitness coach at Rangers in 2004. I was brought up a Celtic supporter, I played there, and for many people it would have been difficult. But being a professional, I knew I should take it. Alec (McLeish) gave me a lot of freedom to work, and we were successful. We won the league the last game of the season, and won the League Cup. The next year we got through the Champions League group stages and came very close to knocking out Villarreal (going out on away goals). Was it difficult beating Celtic to the league on the last game of the season? (Celtic were on course for the title but conceded two goals in the last two minutes against Motherwell). Look, I’m the sort of person who wants to win. The Celtic factor didn’t come into it. I enjoy winning football games and winning leagues. It was all about winning. After Rangers, I went to Dubai to coach for Al Nasr, but I couldn’t settle. The family couldn’t come out and it was hard. As a family, we moved around early in my career, but it got to the point where they needed stability, especially with schooling. So they stay in Scotland, and I work around that. Football can be fickle and insecure – you could move your family to the other end of the country, and the next minute, you’re out of work. When I came back from Dubai, I did some scouting for Middlesbrough. I also did part-time work for St Mirren and the English FA (working with youth teams from under-17 to under-20) and then Gareth (Southgate) asked me to become full-time fitness coach at Middlesbrough. I was a bit reluctant at first. I was building up contacts and life was fine, but it was a way into the Premier League. Unfortunately we were relegated, budgets were cut, and I lost my job along with six other people. Over the past four or five years I’ve been going back and forth to China (to work as a coach for the Chinese national team and Chinese clubs). It’s good to be able to dip in and out, because that’s a completely different culture. It’s a different life, different food, everything. You’ve really got to be able to get your mind round it. You’ve really got to build relationships. My advice to British coaches who want to work abroad? Build your network. Find your contacts. And through your work – and your character – make a good impression, so they want you back. And also, a lot of jobs I’ve taken have been a means to an end. It doesn’t have to be your dream job. It can be about development. Gor Mahia secretary general Chris Omondi has indicated that the club has opened contract talks with Ugandan talisman Dan Sserunkuma. “We are in talks with him and he has shown a willingness to remain with us. He knows what is on the table and we know what he is worth; so that is where we are,” said Omondi to the KPL website. Sserunkuma has played a pivotal role in the club’s success over the past 3 years and fans will be eager to see him renew at the club after his contract runs out in December. Omondi also denied rumours that are running rampant that Sserunkuma has already agreed to terms with Simba of Tanzania. “We have not received any official communication from Simba. These are just things we are reading on social media but nobody from Simba has approached us on the same,” continued Omondi. Sserunkuma for his part has remained silent on his future. “At this point, there is bound to be many rumours but I don’t want to get involved with that. I have my agents doing their part, and I will make that decision when the transfer window opens,” he said a fortnight ago before jetting out to Uganda for international duty. 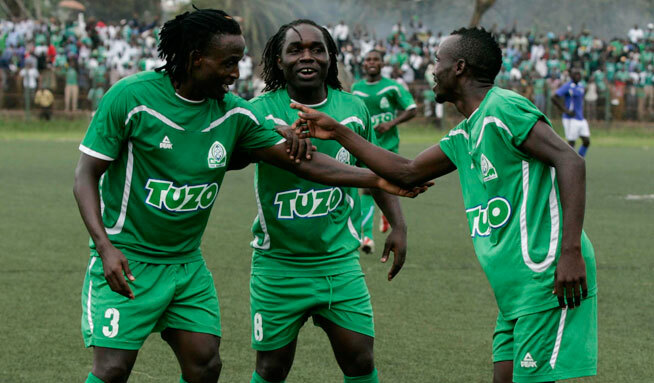 Gor Mahia winger Innocent Mutiso who missed most of the 2014 season, is set to miss at least half of the 2015 season because he will undergo surgery before the end of the year. Mutiso’s last injury occurred during the GoTV shield match against GFC 105. Mutiso praised the club for treating him well during his injury. Mutiso scored one goal this season and it was a gem, perhaps one of the best goals scored this season in the Kenya Premier League. “I am happy that we won, I am happy that my teammates won it for us while I was injured. I look forward to next season and I hope I can contribute to our run when I return. It cannot be gainsaid that the Ugandan Cranes trio of Dan Sserunkuma, Godfrey Walusimbi and Geoffrey Kizito have played pivital roles in Gor Mahia’s success in retaining the league in 2014.Their superb play on the field, professionalism and commitment has been noticed by fans and highly appreciated. They have set an excellent example for the rest of the playing unit. But their success on the field has also attracted the eyes of other teams. Club official Ronald Ngala, fresh from his success at the KPL awards indicated that the club is busy trying to retain the three players. Kizito attended trials with a Vietnamese side while Sserunkuma has attracted the eyes of Sudanese side Al Ahly Shendy, Simba or Tanzania and Kaizer Chiefs of South Africa. All three players features as Uganda Cranes suffered yet another heartbreak in their attempt top qualify for the Africa cup of nations after a 36 year hiatus. Of all the teams in CECAFA, Uganda and Rwanda have taken the longest to qualify for Africa’s premier event. Got early jitters at left-back from Ibrahima Conte, settled in briefly, but later ran out of ideas. He just had a bad day in office. Baba imposes his presence on games but his passes were mostly square and the Gor Mahia player barely found midfield partner Mawejje. When Mwesigwa’s actions wrecked the plan, dread-locked Sserunkuma found it hard to link up from the middle. Still, he was an improvement on Miya. Godfrey Walusimbi 5.0: Started the game on a slow note being turned in and out by man of the match Ibrahima Traore. Lucky not to be booked after a number of fouls but grew in stature in the second half though his side was more of an avenue for the Syli Nationale. Geoffrey ‘Baba’ Kizito 5.0: Struggled against the quick passing Guineans and provided less cover to the backline. Daniel Sserunkuma 6.0: Came on for Farouk Miya and gave Uganda some momentum in attack but it was too little too late. He is the only player who registered a shot on target for Cranes. All in all the Cranes had a bad day at the office with the exception of keeper Dennis Onyango who was rated highly. The Report from KTN : Chair Ambrose rachier explains how the club overcame its financial difficulty to win the league. Gor Mahia striker Dan Sserunkuma had a phenomenal season in which he finished atop the Tusker premier league scorers chart with 16 goals. He was consistent throughout the season and when he was not scoring goals, he was setting up his strike partners with scoring chances. It stands to reason that he would be considered among the candidates for the player of the year , a title he won in 2012. “He (Sserunkuma) may have emerged top scorer but we also looked at how some of the goals were scored. Out of 16 goals, he scored three penalties and in our opinion some were not genuine. Furthermore, we felt that some of the goals he scored were from off-side position. If referees did not see it, we did and took note.” said a coach who sought to remain anonymous. These kind of wild claims are reminiscent of Chemelil coach Mike Mururi who claimed that Gor Mahia wins because they get help from referees. At this rate it would have not come as a shocker if they gave the golden boot award to someone else. Sserunkuma and his team-mate Goeffrey Kizito did not attend the ceremony as they were away with the Ugandan national team which was attempting to qualify for the Africa cup of nations. Unfortunately there was further disappointment as the Cranes once again fell short at the last hurdle. Frank Nuttall is away in Scotland for a 6 week holiday. The Scottish coach has been living in a hotel since his arrival in Kenya. 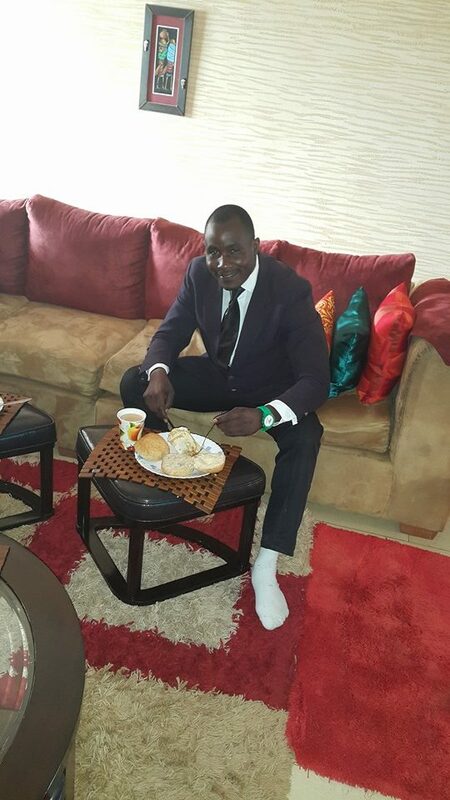 The house he is supposed to occupy is still being occupied by former coach Bobby Williamson while Nuttall’s hotel bill is paid by the FKF.Williamson for his part cannot move because the house he is supposed to occupy is still occupied by former coach Adel Amrouche. Its is a mess at FKF. However reports suggest that Nuttall is tired of hotel life and says he will not live in a hotel when he returns. “Nuttall has made it clear that he does not want to stay in a hotel when he comes back. 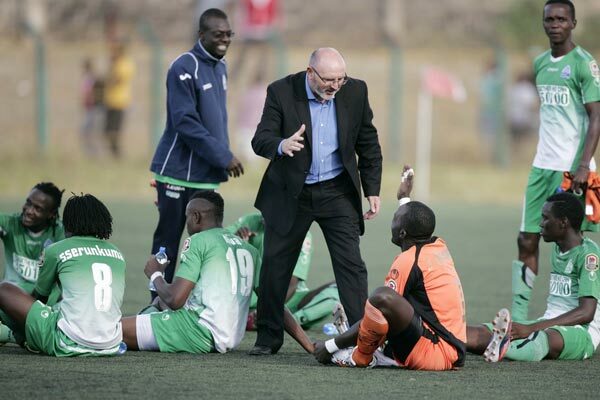 It is a tricky situation for us because we cannot evict Williamson.” said a Gor Mahia official. 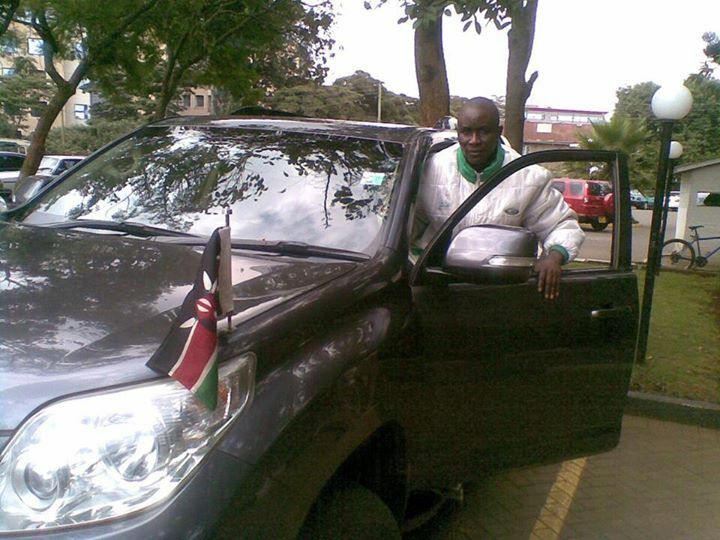 When Gor mahia visisted president Uhuru Kenyatta at state house after having won the 2014 Kenya Premier League, Famous Gor Mahia fan Jaro Soja was offered a job by the president. On Thursday Nov 20, Jaro Soja officially reported to work. 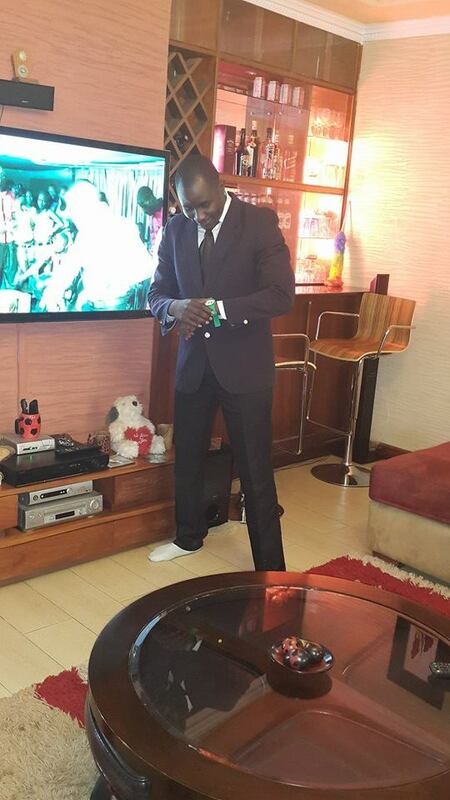 Dressed in a sharp suit, Soja appears to be having a blast in his new digs. Though it is not clear what he will be doing. But since the directive to employ him came from the president, he could even spend all day sharpening pencils while taking visitors in his spacious office. Hopefully Soja uses his new influence to get Gor Mahia cheaper training accommodations. For the second season running, Gor Mahia’s dependable defender David Owino “Calabar” retained the defensive player of the year award he won in 2013. A just reward for a player who has been consistent for the past two years. 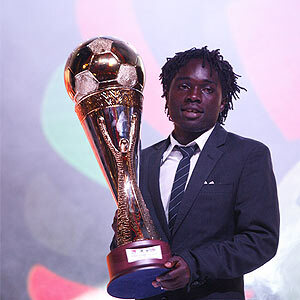 Dan Sserunkuma was award the golden boot award. However it is not clear why other players were even nominated given that Sserunkuma was clearly the top scorer. Midfielder Geoffrey Kizito who has been solid and dynamic throughout was somehow beaten by Anthony Ndolo of Sofapaka in both the player of the year and the midfielder of the year awards. It is not clear why Sserunkuma was not nominated for this award. A report by the Standard indicates that there was widespread bribery and side deals conducted by the coaches who were assigned to do the voting. “It is unfortunate that, as coaches, we showed open bias yet we are the technical people entrusted with this important exercise to reward deserving players,” said a source. “A section of coaches want a thorough investigation launched into a clandestine meeting some coaches reportedly held to discuss how they would vote,” the source said. Disquiet has been building up over the years, especially that KPL Foya winners, except with Sserunkuma in 2012, have failed to replicate their talent in subsequent seasons. Apparently some of the coaches approached the nominees and demanded a slice of the prize money in return for votes. Winners in each category are given KES 100,000 with runners up getting KES 75,000. With the season over, attention now turns to the transfer season. This year Gor Mahia is less active than in past years. One of the players Gor Mahia is rumoured to be targetting is Muhoroni Youth Striker Ezekiel Otuoma. Muhoroni Youth punched way above their weight this season and one of the reasons was Otuoma. The pacy striker gave defenders nightmares with his mazy runs and precise finishes. 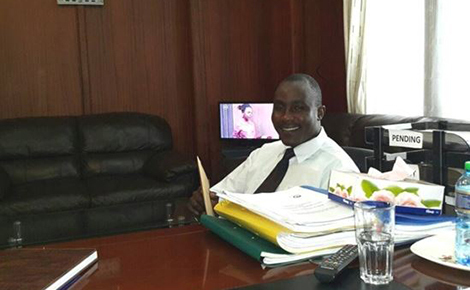 However Muhoroni Youth Chairman Moses Adagala was categorical that Otuoma is not for sale. “We want to tell Gor Mahia and any other club that is interested in our players that none of them is for sale. We are inspired by our recent performance in the league and intend to go for the title in 2016. Another player whom Gor Mahia are said to be interested in is Ugandan striker Robert Ssentongo who plays for Uganda Revenue Authority and is the top scorer in the Ugandan league. 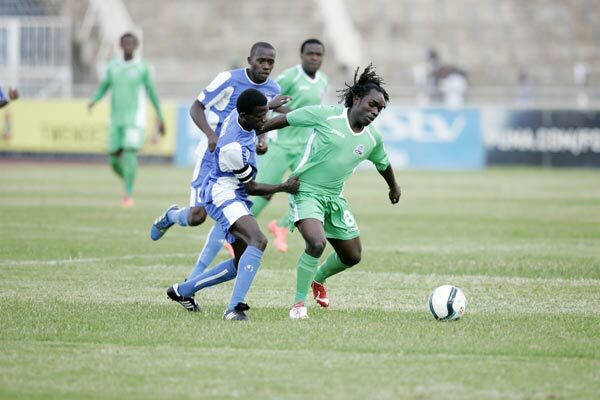 Back on the local scene, Mathare United playmaker Harrison Mwendwa is being pursued by both Gor Mahia and AFC. “It’s true there have been several offers from a number of top teams which I will not mention at the moment but I am yet to negotiate with one,” Mwendwa told Futaa.com. “I am weighing my options before falling for any deal,” added the Mathare United star. Mwendwa first rose to prominence in 2010 at the national schools championships. At the time his brilliant play helped steer Jamhuri high school to the national schols final. Most notable was his brace against Waa secondary in the semis. Mwendwa would be a good fit for Gor Mahia who lacked playmaking last season. Back in 2012, Michael Olunga was the top scorer and MVP of the national schools football tournament. At the time he declared that he was a Gor Mahia fan and wanted to play for the club. Surprisingly Gor Mahia did not pursue him even when Olunga received high praises from experienced coaches like Mohamed Kheri who described him as the next Mike Okoth. Olunga was among the top scorers in the league this season and would be a good fit to play upfront with Timothy Otieno and Blackberry. Newly promoted Shabana FC have approached Gor Mahia for assistance. According to a report posted on futaa.com, Shabana wants Gor Mahia to loan them some of the players who are scarcely used at the club. “It’s true we have approached Gor Mahia to loan us few of their quality players who have lacked playtime and since they will be preparing for continental football, probably not all of their players have the mettle to feature in such a pressure-mounting competition, the former Congo United and AFC Leopards coach said. -We are hoping that our proposal will go through since some of their players have the experience to help us locally and warming the bench at the club won’t help them develop as we bolster our ranks for next season.” said Gilbert Selebwa, the Shabana coach. Among the players who saw little playing time are Joel Bataro, Daniel Onyango, Herbert Kopany and Angelo Okumu. The latter went on loan to Nakuru All Stars but they never used him. Club chairman Ambrose Rachier has said that former coach Bobby Williamson was most responsible for winning the 2014 premier league. His last match was against SoNy Sugar in early August before he took the Harambee stars job. Williamson joined Gor Mahia in mid 2013 taking over from Croatian coach Zdravko Logarusic who refused to return to the club after going on holiday. During Williamson’s tenure, Gor Mahia was always at or near the league summit. The one blemish on his record was his inability to win the Mashemeji derby. “I feel disappointed I leave the club having not won any derby in four attempts but I’m happy I leave the club in good position to defend the title and everybody seems to love the way we play,” said Williamson on his last day in charge of the club. Famous Gor Mahia fan Jaro Soja who was offered a job by the president has furiously denied reports that he turned down the job. “Contrary to the romours going round that I have turned down the job offered by the His Excellency Uhuru Kenyatta, I wish to clarify that I am and will always be available to serve him and Kenya at any capacity he requests me to. To all Gor Mahia fans, I remain one of you. I am a Kenyan first, then a Gor Mahia fan. I once again thank my President for his faith in me.” said Jaro Soja posting in social media. There was a report on K24 news suggesting that Jaro Soja had turned down the job and was instead requesting money to start a business.